Paintings, floorcloths and other home accessories designed by Debra Gould. Hand painted floorcloths by artist and designer Debra Gould provide a delightful focal point in any room. Amazingly durable, this 'art you can walk on' can be used on any hard and even surface such as wood, laminate, vinyl or concrete. Ideally suited to today’s hectic lifestyles, floorcloths are extremely practical for hallways, bedrooms, kitchens, foyers or family rooms. Perhaps you need a mat in front of your sink. Why have a boring thing that you never notice or appreciate? Imagine instead, walking into your kitchen every morning and seeing something that brings a smile to your face. 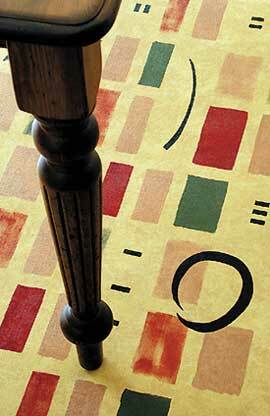 The Floorcloth Collection, by designer Debra Gould, is quite broad and grouped into themes. You may wonder how they can be durable enough to withstand heavy foot traffic. The secret is in the construction.You need only wipe with a damp cloth to keep floorcloths clean. In addition to their surprising durability and practicality, they can be customized to any décor. Smaller canvases make excellent “toppers” for night tables or dressers (see Table Art). To order a product on this site, or if you are considering a commissioned piece, please contact us for availability, pricing and shipping costs prior to your order. Payments can be made by PayPal, Visa or MasterCard. ™Debra Gould Home Collection is a trademark of Voice of Possibility Group Inc.
© 2000 - 2019 Voice of Possibility Group Inc. All rights reserved. Republication or dissemination of this content is expressly prohibited without written permission.